At this chateau in Normandy, modern New York design meets classic French elegance. At this chateau in Normandy, modern New York design meets classic French elegance. 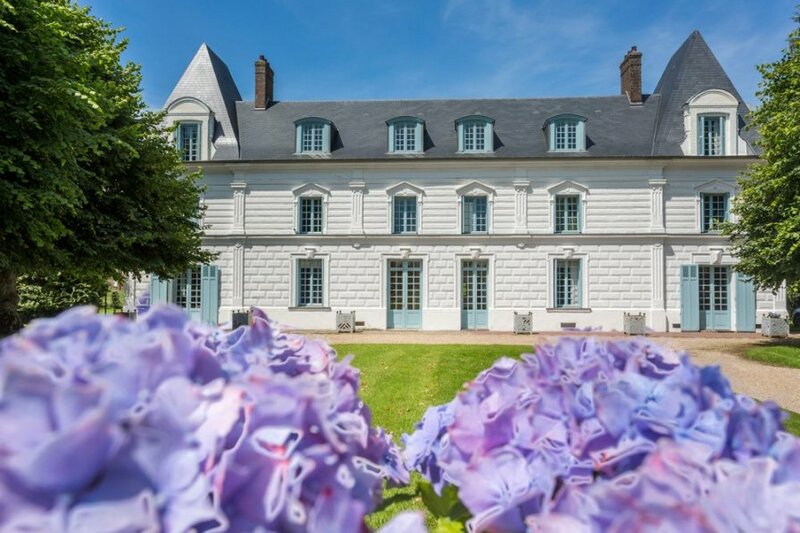 You'll instantly see why this chic 17th century chateau has been featured on the covers of Maison Normandes and Elle Decor. The sunny interior has been expertly designed, with stylish sitting areas throughout the house where you can relax, have a chat, and gaze out towards the banks of the Seine. A wonderful new spacious conservatory, featuring an impressive La Cornue kitchen, offers further opportunities to relax and socialise with family and friends. The splendid formal dining room, featuring silk handprinted De Gournay wallpaper, is ideal for lingering evening meals on cooler evenings. Wine aficionados can also head down to the two original caves under the chateau which have been lovingly restored to create the perfect spot for wine and cheese tastings, sampling the fine products that this region has to offer. Outside you'll marvel at the beauty of the arbor - where you can dine together under the grape leaves on warm summer evenings. A stone's throw away is the chateau's newly refurbished private heated swimming pool surrounded by comfortable loungers and beautiful paving featuring Spanish mosaics. The ten acres of land include formal gardens, a pond and lawns, perfect for a spot of cricket. If you want to explore beyond the grounds, borrow a bicycle and take a ride through the fields to the nearby village to pick up fresh bread and croissants or wander further afield in the beautiful surrounding countryside. A 40 minute drive will take you to the capital of the Normandy region, Rouen (40 km). This medieval city holds historic and artistic treasures, like works by Monet at Musee des Beaux-Arts de Rouen. Indeed, Monet's own gardens at Giverny are just an hour's drive from the chateau. With Paris and the D-Day beaches each only 2 hours away, northern France is at your fingertips. The owners have taken great pride in creating an elegant yet inviting ambience at Chateau de Jonquier, ideal for those wishing to experience graceful style, exquisite surroundings and a warm welcome in this idyllic part of France. Chateau De Jonquier is located in beautiful Normandy countryside and farmland. The nearest town is Bourg-Achard where you will find a handful of restaurants and a bakery who will deliver bread and pastries to you each morning if you wish. Normandy has a huge amount to offer – and most of it is within a reasonable drive of the chateau. It has something for everyone from old cities such as Rouen (40km) where Joan of Arc was burnt at the stake, Monet's garden at Giverny (80km), the landing beaches at Omaha and beyond (155km) and further historic sites such as the Bayeux tapestry (135km). Paris (145km) can be easily reached by train from Rouen in under 90 minutes or alternatively drive to the delightful seaside resort of Deauville (65km) where you will find designer boutiques and lovely beaches. Honfleur (50km) is one of the many pretty fishing villages in Normandy or head to the pretty village of La Bouille (18km) where Monet painted La Seine. Normandy is rightly famous for its food - especially the cheeses such as Livarot Camembert, and Pont l'Eveque - and Calvados, the apple brandy. Local markets are fantastic and are often the major source of food for the locals, Friday market in Pont Audemer (25km) is particularly good and there are many others in the region, as well as excellent restaurants with fine local cuisine, many with Michelin stars. Activity lovers will appreciate the great walking, cycling and horse-riding in the area as well as golf within half an hour and canoeing along the natural beauty of the Risle within fifteen minutes.